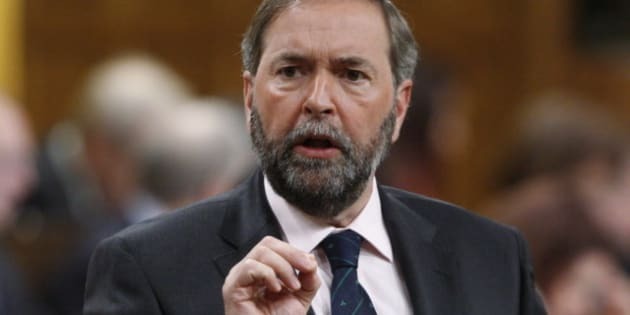 TORONTO - Blasting cuts to research agencies and tighter controls on public files, NDP Leader Tom Mulcair vowed Sunday to lift the shroud of secrecy he believes has spread over Parliament Hill under the Harper government. When it comes to keeping public information under wraps, the Conservative government is "unlike any we've ever seen" in Canada, Mulcair told the annual convention of the Canadian Association of Journalists. "We politicians have a bad habit of claiming that every government we sit across from in Parliament is the worst in Canadian history... but you know what, it's finally turning out to be absolutely true," Mulcair said. By axing agencies such as the National Roundtable on the Environment and the Economy _ organizations whose main role is to produce statistics _ the government is going beyond simply restricting access to information, he said. "The government wants to prevent inconvenient data from being generated in the first place," he said. Mulcair said his party will keep fighting for transparency, even if that means its own feet will be held to the fire. Mulcair made the comments a day after the CAJ granted Stephen Harper's government this year's Code of Silence Award, which recognizes Canada's most secretive government or publicly funded agency. The Tories have put forward a three-year blueprint for open government, but critics _ including the NDP _ say it falls short of improving accountability. The federal plan promises to modernize the Access to Information process by allowing online requests. It would also create a virtual library of government documents, improve federal record-keeping, make more archival material accessible and build on efforts to release government data. While the NDP stands behind some of those initiatives, Mulcair said the plan isn't enough to make up for the government's overall clampdown on communication. "Neither New Democrats nor the needs of Canadians will be satisfied by a few online gimmicks," he said. "Access to Information will not genuinely improve without heavy pressure." Treasury Board President Tony Clement, who oversees the open government plan, was not immediately available for comment.